This week… bit crazy… but it felt good! Sometimes it takes a hard deadline to get us moving, but it was great to see how well the team responded. The level of focus and productivity (including all of our new team members) is currently higher than it has been all season, and we all feel much more confident about next week as well as FRC in the spring. This week, the primary objectives were to complete revision #1 of the final robot CAD as well as complete the notebook. 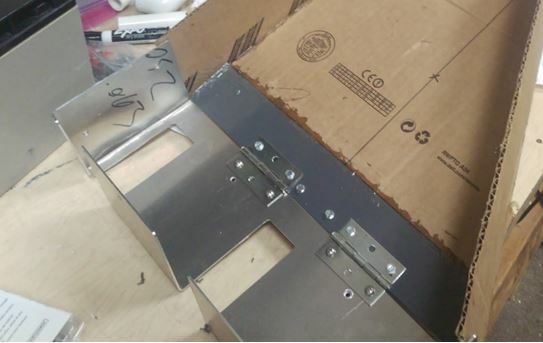 Additionally, we were able to make some booth items and some “known” final parts for the robot. I’ll spare you all another picture of students at a computer, but … super proud of the handful of students that carried this one across the finish line. There were a few late nights involved, but it is complete, it has all the required sections, and I think it really captured the season well. There were a lot of terrified looks when we found out we had a single week instead of two to complete it, but they made it happen! As shown in the title image, we decided to go ahead and make the wheel hubs. We needed them to test the 6″ wheels, and they were a great chance for a few students to go all the way from design, to programming parts on the CNC mill, to follow-up operations such as cleaning up the 1/4″ deep hole, drilling and tapping four holes to align to the wheels, and drilling and tapping for a set screw. At the end of the day, we now have several more students that are more comfortable with metalworking, which will be super important in the spring. The robot CAD team made some pretty big strides this week. On the right, most evident is a thing that looks pretty much like a complete robot! Again, super excited to see it come together, but a little closer inspection does lead to some questions like “how does X mount to Y” and “is part Z strong enough”. There are also a few interference issues, sensor mounts, etc. that need to be figured out. The part on the left is one of many answers to those questions. The challenge was to create a part to fit on the bottom of the seed dispense magazine that could release seeds at the appropriate time. The solution created was a 3D printed part (new rule, yay!) that covers the gap between the 2×4 and the seed magazine, holds a servo with a (TBD, arm? slot? etc) to start/stop the flow, and a microswitch that automatically opens the flow when it is resting on a 2×4. This makes one less thing the driver has to remember. All of this sounds great in theory. With the notebook done, the next key action is to cut everything out on Monday so we can assemble revision 1, and start discovering what works well and what requires strengthening or other redesign, while simultaneously getting in a little driver practice. As a quick update on the booth, Oscar is leading the effort to make some very cool MDF panels that will be painted to look like a corn field. This project reminded me… its pretty cool to have a 4’x8′ capable mill… and we should use it more often for artistic projects. Four of these (two mirrored) will go together to create a sort of maze entrance to the booth. Finally, we were able to work with JJ Pearce again this year and help make a part for their robot. 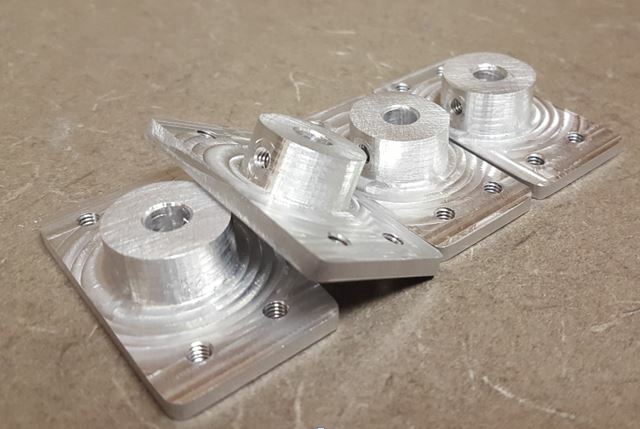 Their game piece acquisition method has some similarities to ours, and they needed a reasonably precise part machined out of sheet aluminum and then bent. It made more sense to run it at our shop and use our 36″ finger brake to construct it.